Welcome to Hy-Pointe Ranch. Located in Simpsonville Ky. near the Jefferson County line, also known as ''The Saddlebred Capital of the World''. The luxurious walkout ranch is situated on 87.916 acres. The original home was constructed in 1988 and a stunning renovation occurred in 2008, redesigning the 3100 sq. 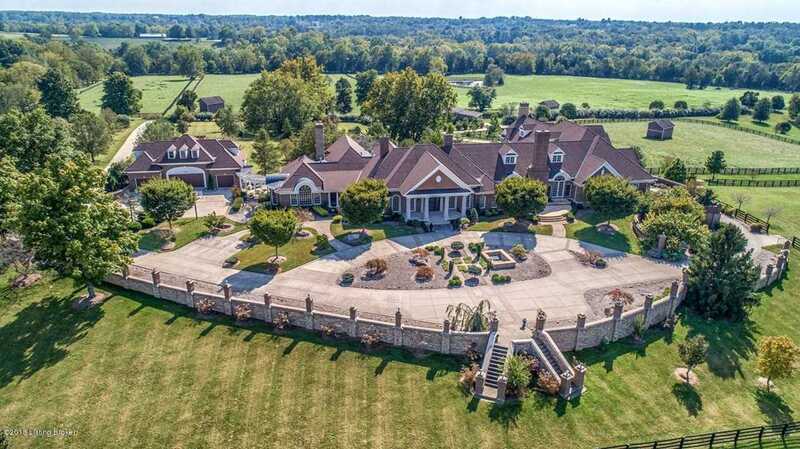 ft home into a mansion of almost 12,000 sq. ft (above grade) and 7,452 sq. ft on the lower level. The entire west side of the home was new construction. This home is a true dream home and leaves nothing to be desired! With palladium windows throughout you are ensured panoramic views from virtually every room in the home. The property includes 3 ponds, 4 board fencing (poured in concrete), and several paddocks with electric and water. Other site amenities include stamped concrete drive to the main house with circular front drive and additional concrete to the octagon barn area. Other site amenities include a heated and cooled 4 car detached garage with a carriage house above having 2 bedrooms, 1 bath, living and kitchen area with laundry closet. There are numerous walkways, terraces, screen porches covered porches, steel deck with Trex composite decking, large, heated in ground pool, extensive landscaping, a large green house attached to the garage, 3 car built in basement garage with hot and cold hose faucets for washing cars, and a covered breeze way/portico area. The octagon barn has a run-in shed along with 7 stalls, 3 of which are large birthing suites, a tack room and plenty of storage for equipment. There is a second barn which includes 3 stalls and equipment shed. The first floor boasts a formal entry hall with rain forest marble flanked by a formal living room opening into the grand salon which has a limestone fireplace and Travertine flooring, three en suite bedrooms, second floor loft area with powder room, walk around morning kitchen and master suite featuring "his" and "hers" master bath with heated marble floors and "his" and "her" temperature control steam shower, whirlpool bath with private laundry, large walk in closet with built ins, sitting room with fireplace and private screened in porch with fireplace. The chef kitchen includes 2 large 6 burner gas ranges, Northland refrigerator, GE monogram appliances, warming drawer, additional ice maker, compact, butler's kitchen and large walk in pantry, large middle island with bar seating and gorgeous granite and Caesarstone quartz counter tops. The walkout basement offers virtually every entertaining amenity including a media room, billiards room, smoking lounge with own filtration system, wine room with clay tiles and wine tasting bar with rain forest marble counter top, kitchen, lounge, recreation room, three additional en suite bedrooms, and aquatic marvel koi pond with water feature. All of which lead out to an outdoor professional kitchen with dining areas and an in ground heated pool. There is an additional three car built in garage in the lower level. The interior finishes are all impressive custom designed specifically for the owners including mahogany, maple, walnut, Travertine flooring, rain forest marble, ten fireplaces, master carpentry and custom built ins, profile ceilings, dry sauna, whirlpools baths, two central vacuum systems, security systems, two fresh air exchange systems, eight hybrid furnaces with UV lights, electronic filters and humidifiers and an elevator. The sophisticated retreat reflects the magical merging of inspiration and architecture. A true masterpiece of design and craftmanship that must be seen to appreciate. Directions:From Louisville I-265 Gene Snyder to US 60 East Shelbyville Rd. Entrance to home approximately 7 miles on the right. SchoolsClick map icons below to view information for schools near 9936 Shelbyville Rd Simpsonville, KY 40067.